Brand: Nexan Building Products, Inc. The Polaris Solar light radiates the night through solar power. 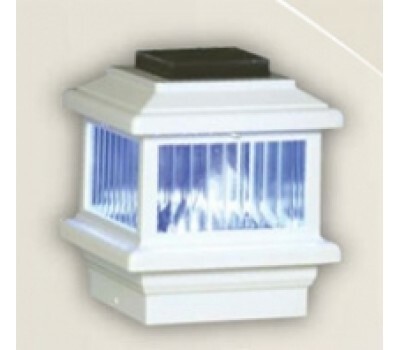 These solar powered lights fit a wide range of post sizes and fit wood, vinyl posts and metal posts. The Polaris light is designed specifically to receive the powerful solar cell. All Polaris Series lights come with 700 ma high capacity batteries that capture the Sun’s powerful energy. Polaris lights are designed to illuminate for up to 14 hours. Update the look of your deck with lighting options. Powder coated finish for low maintenance. Can be used with wood, steel, composite and aluminum railings.